Jun 1, 1965 (Age 53) Leigh, U.K.
England’s Nigel Short has been a prodigy, a World Championship challenger, no. 3 in the world and lately the strongest active player for his age. He first shot to fame by defeating the legendary Viktor Korchnoi in a simultaneous display at the age of 10, before becoming the youngest ever participant in the British Championship a year later. At 14 he was the youngest International Master in history, tied for first place in the British Championship and missed out on the World Cadet (U17) title on tiebreaks. 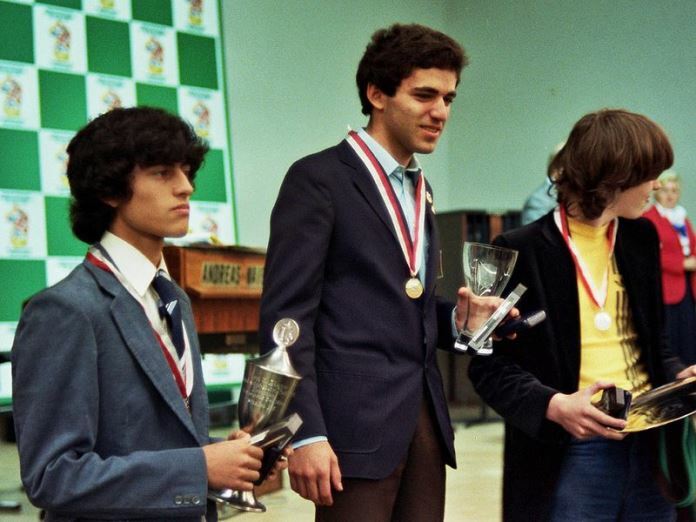 In his first World Junior Championship in Dortmund in 1980 he finished clear second behind Garry Kasparov and he was the world’s youngest grandmaster when he received the title as a 19-year-old in 1984. Short has gone on to win or tie for first in countless tournaments, including claiming three British and one English Championship, winning Wijk aan Zee in 1986 and 1987 and finishing in joint first above both Anatoly Karpov and Kasparov in the 1991 Amsterdam VSB tournament. He’s been a regular England player since competing in the 1983 European Team Championship as a 17-year-old, and has taken part in over 15 Olympiads, with his best performance featuring team silver and individual gold in Dubai in 1986. The most memorable period of his career, though, was the path to a 1993 World Championship match against Garry Kasparov. After tying with Vishy Anand in third behind Vassily Ivanchuk and Boris Gelfand in the 1990 Manila Interzonal tournament, he won matches against Jon Speelman (5.5:4.5), Gelfand (5:3), Karpov (6:4) and finally Jan Timman (7.5/5.5). The World Championship match with Kasparov that followed in London in 1993 was the first in two decades that didn’t involve Karpov. It was also noteworthy for the players breaking away from the World Chess Federation (FIDE) to hold the match under the auspices of a newly-formed Professional Chess Association. That ushered in a 13-year period of chaos in the chess world, during which there was no fixed World Championship system. On the board, though, the match was won easily by Kasparov, with six wins, 13 draws and one loss, even if the 12.5:7:5 scoreline doesn’t really reflect how close Short came to winning a number of games. After the match Nigel remained an active tournament player and continued to test his mettle against a hugely talented new generation of players. As well as playing Nigel has coached, writes newspaper and magazine columns, became involved in chess politics and has recently become a sought-after live commentator for top chess events. The match against Kasparov has been relived in a series of rapid chess matches against the great champion, including in Belgium in 2011 and St. Louis, USA in 2015. A pioneer for British chess in the 90's. Always thought of Nigel as the " Steve Interesting Davis" of the chess world. As it happens both have wicked sense of humours and both have excelled brilliantly at the table. One of the best English players of any generation.